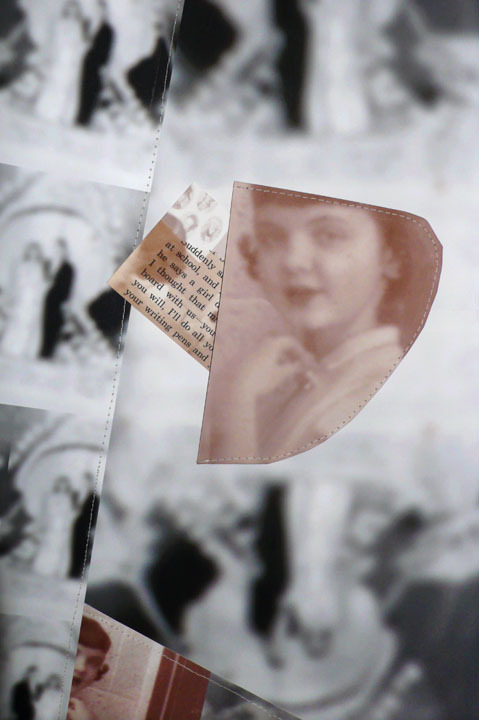 Domestic Lives of Others is a story about two people, my parents, told through a series of photographs, originally from my family photo albums, that have been reclaimed to serve as the text of a larger cultural experience. Although these snapshots are of my family they could just as easily been of yours. There is a universality to the family photo album and the images found within. Often this common ground comes through the recording of an event such as a wedding or a scene from a vacation. However, the true universality of the images lies beyond that which is represented and resides within the less obvious, more subtle space of the frame. Removing the specifics and paring the photographs down to their barest elements exposes the indicators of our shared cultural and human experience. Through the process of selecting and removing details; deconstructing and re-contextualizing, I am engaged in understanding my parents as individuals before they met and married, and through understanding them, learn something about myself and broader world we share. The snapshots used predate my life and although I have selected them, have no first hand knowledge of their reality. I am forced to study each element within the image as if reading a novel. Reading the cultural signifier to understand the story of who these people were. An act of deliberate and complete looking. What did that look in my mother's eyes mean? What was she thinking as she stood, in her beautiful dress, corsage on wrist, next to that boy, who was not my father? What does the image of my father in his Navy uniform tell me of a boy's dream of a military career? I am a forensic scientist searching for clues. Each snapshot is examined to find that one small, easy to overlook entry point, which once identified, becomes the fabric of the apron. Isolating details fosters an ambiguity which allows the development of a narrative that goes beyond my personal family and offers the possibility that others may explore their own story. Meaning evoked by any photography doesn't spring from the image itself but is generated though a network of discourse that shifts between past and present, viewer and image, and between cultural and historic moments. This shifting forms a constellation of cultural codes that allow the viewer a variety of understandings. The choice of media for this series was an important factor in the way the work is to be read. Vintage apron patterns, from the same time period as the original photographs, speak to the domestic work and crafts of women as homemakers. The form of the apron, a signifier of the domestic often associated with the past, is a way of forming a bridge between the viewer and those viewed. 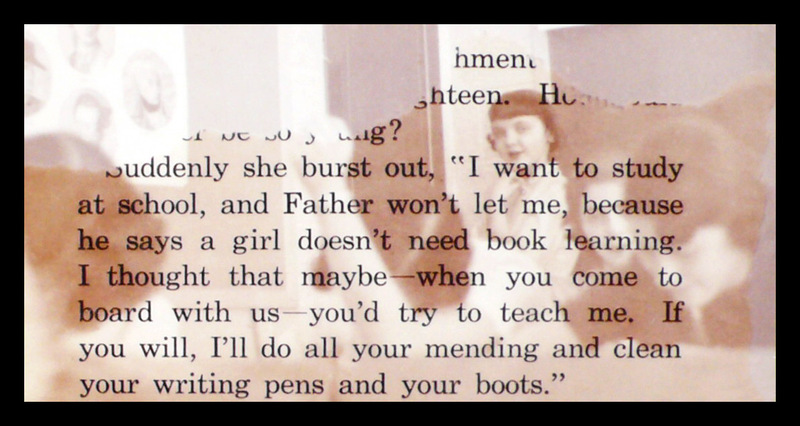 Appropriated images and text are sometimes added to further push the personal boundary into a broader context. 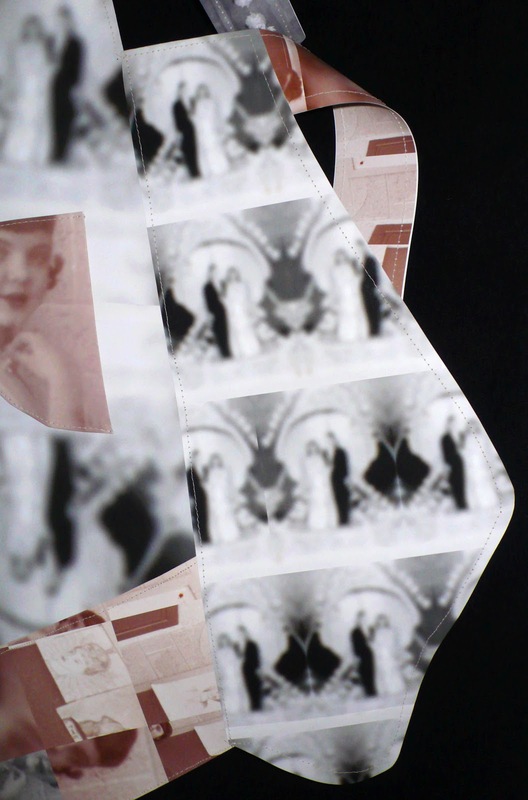 The choice of enlarging and sewing the scanned snapshots into a domestic form parallels the way in which memories and meaning transform. Through the process of reconstruction, the snapshot's original meaning is mitigated just as the passage of time and experience mutates remembered experience. The use of photographs on paper, as opposed to fabric, mirrors the awkwardness and inexactness of recreating and representing meaning from an unknown past. The heavy paper resisted the folding and gathering called for in the pattern directions; its stubborn unwillingness to be manipulated yielded final pieces that resisted my control . The results are oddly familiar forms of something that is meant to be useful, and refashions it into an impractical and unusable object. Just like memories, you can only control their meaning to the extent their inherent truth allow. 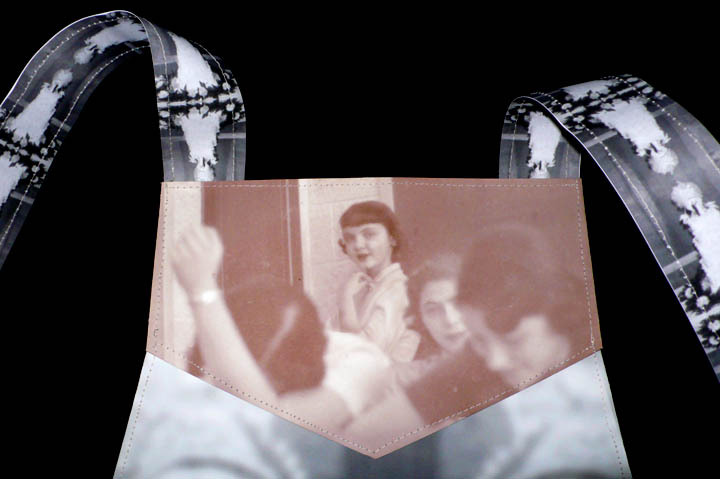 The body of the snapshot aprons range in size from 24" to 42" long, 30" to 36" wide (depending on whether the pattern was for a small, medium or large women). The apron ties average 2" wide by 26" long. 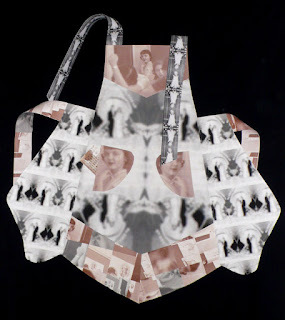 The individual aprons were conceived to act as pages within a book. Each apron is a chapter within a story that is still being written. 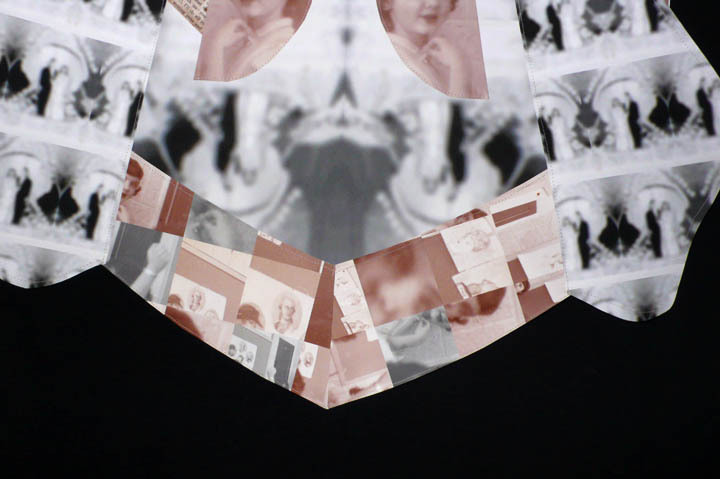 The reconstruction of the snapshot and its placement in the fabric of the piece requires some of the aprons to be viewed flat against the wall while others may be formed as if being worn and hung extended from a wall.